April is Sports Eye Safety Awareness Month. For this reason, we’d like to focus on how you can keep your child’s eyes safe during recreational activities. The safety of your child’s eyes is not something to be taken lightly. Protecting your child’s vision is important now in order to set her up for fewer problems later in life. When it comes to kids eye care, there is one sure-fire way to provide protection during sports: utilizing the proper protective eyewear. While you certainly don’t want to keep your kids from enjoying their favorite sports due to a high risk of eye injury, you should take every measure necessary to ensure their safety. Sports present many opportunities for injury in children, even more so than adults, since children’s bodies aren’t yet fully developed. The eyes are no exception to this rule. According to The American Academy of Ophthalmology, each year more than 40 percent of eye injuries occur as a result of sports or other recreational activities. The organization also reports that of the injuries noted, 78 percent happened to people not using protective eyewear. Such a simple thing makes such a huge impact in the health of your child’s eyes. 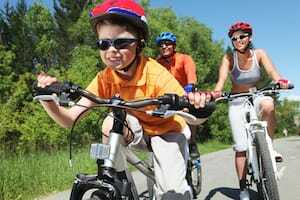 Just as you would never think of letting your kid ride a bike without a helmet, so should you never let him play sports without protective eyewear. Will he mumble and complain? Sure, but it’s your job as his parent to secure the future of his eye health. If you think your child may have already suffered an eye injury or is at high risk, call to schedule an appointment today. Don’t let another minute pass without taking your kid’s eye health seriously.